Porto Alegre's new talent offers an insight of his music vision to resurrect Extreme virtuosism through the latest "Firestorm"
-HELL-o Carlos, how are you doing? Can you write a short biography for those who still don’t know your career? 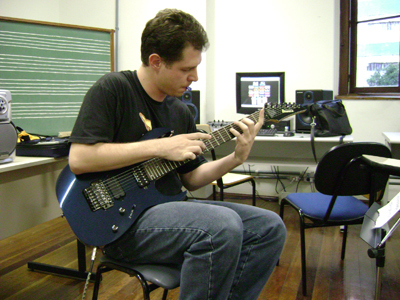 I’m a Brazilian guitarist; I have degree in music performance at the University of Porto Alegre in Brazil. My compositions are into Instrumental Shred Metal Style. I played in a band called Neverland and recorded some stuff (Wake Up The Dragons EP/2001) before the aforementioned solo debut, e.g. "Planet Rock" (Single, 2003) and "Intense Guitar Playing" (EP, 2005). However, my playing can be also audible on "Celebrando Mozart" Live DVD from the year 2006. In 2007, I recorded my debut album called "Firestorm". I played most guitar parts and keys on one track. In that album, I recurred to two drummers (Alexandre Olly, Sandro Moreira), two bassists (Leandro Berpo, Vinicius Rym) and a keyboardist (Paulo Miguel Bublitz). I can say they are the "less known" part of the stuff. The "better known" are guest guitar players: Kiko Loureiro (Angra), Pablo G. Soler (Neoclassical shredmaster from Argentina), Francesco Fareri (Italian Shred wizard) and Jim Horne (Jazz/Fusion guitar virtuoso from the USA). Firestorm is larded with shredding tones. However, here are also some quiet fragments like Thoinot Arbeau's "Belle Qui Tiens Ma Vie (Reincarnation)" that can make you think of Renaissance dances. It is played in calm and minor mood, so it gets a great contrast in comparison to the remaining tracks. The third track "Key To The Shred City" was recorded in honour of two shred giants - Tony MacAlpine and Marty Friedman - as they are two of my greatest inspirations. Yes, there were such tracks like Friedman's "Forbidden City" and MacAlpine's "Key To The City". However, this piece of music is performed in definitely different style than compositions from Marty's "Dragon's Kiss" and Tony's "Maximum Security". Anyway, it is one of the most melodic tracks with powerful rhythm. I’m a chap who attacks your ears with rhythmic lead parts, numerous shred quips and some atmospheric fragments as well. I showed you a complex architecture of the shredding genre as I depicted it on the CD. The album's title reflects my music as a stormy, furious, fiery and belched out stuff. People usually say that "Firestorm" is a great load of decent Shredding power and it is one of the TOP SELLERS on Guitar 9 Web Site (N°1 in March and April 2008). Last May I released FIRESTORM GUITAR METHOD, a new method based on FIRESTORM CD licks. I’m endorsed by Giannini Strings and Basso Straps. -When did you start playing guitar and who were your teachers? Are you self-taught? I began to play at the age of 14. I studied with Paulo Ross during 4 years (Classic Music). During few years I was self-taught studying instructional videos and guitar methods. After Neverland breaks, I studied with Edilson Avila (Fusion Style) and Marcos De Ros (Shred Style). Of course, when I was self-taught I studied a great deal of styles and guitarists always keeping the heaviness. In 2005, I went to the University of Porto Alegre in Brazil and took my music degree in December 2007. -Do you think a guitar virtuoso like you always does need to know how to read notes or is it enough to have trained ears? Nowadays, everything is very important to improve your playing, I coach my students to learn more and more about music. It’s necessary to read notes as well as to have a trained ear. To know about music theory, to understand how scales and chords work. I have been studying since I was 14 years old and I still learn more new things. It’s very important to practice with a band, to make gigs, to record demos. I mean it’s important to live music! -Did you write all of the songs of your latest album or did you get ideas from the drummer, the bass player and the other musicians as well? How are your songs created? Do you always start from a riff or do you jam and keep the best parts of a song? - “Speed Rules” and “Shred Dogs” are totally influenced by Rusty Cooley’s album as instructional methods. - “Key To The Shred City” is influenced by Japanese minor scale one of the scales most used by Marty Friedman. - “Just Rock It” is a Blues/Rock song influenced by Brazilian guitar master Edu Ardanuy. - “Belle Qui Tìens Ma Vie” shows my passion for old music and in my next works, I will record more and more songs in this style. - “Drug Dealers” was created when I was studied “The Book of Jason Becker”. - “Endless” shows some riffs in Impellitteri’s style and studio’s effects as Tape Reverse. When I was studying “home studio’s production’ in the university I enjoyed this effect a lot. - “Intense Guitar Playing” is a mixing of Vinnie Moore and Steve Morse’s influences. I really like their way of playing. - “Beyond The Universe” is the last song of Firestorm and this music show lot of influences as Gilbert, Satriani, Cooley and Petrucci. In the end of the song, Alexandre Olly (drummer) told me and idea to play the song in 7/4 and not in 4/4 as in the beginning. I’m not saying that I don’t accept other guys’ opinion but I usually work alone. The main ideas come from my seven string guitar. -What are the differences with your previous records? They are always different in all details. I used to practice more and more, I search for new and modern ideas; different effects and distortions, new ways of tuning. I never record the same kind of music, I always try to show some thing new to the listeners, improving my music, not just as player but as an artist. -Who chose the front cover? And will you ever release an album with sung compositions? Don’t you ever feel the need to add vocals to one song? I chose every detail in the CD, the number of track, the pictures, the studio, the musicians to participate. When I decide to record something, everything is chosen by me. It’s my name on the record. I can’t do anything but record more CDs. Some people asked me the same question. But I’m working in a new band with vocals, not a solo record with vocals but in a real band without guest players. Of course, I’m working on new compositions for a new instrumental solo album but you know the composition process takes much time. -How did you convince all those guitar heroes to participate as guest musicians in your latest record? Did you have to pay them or was it just because you’re friends with them? Many people want to know if you will appear in their next records. Haven’t you got any invitation so far? Many of them have been my friends since I decided to work as a solo musician. They know my work and how I respect them as musicians and people. We have the same dream as guitarists, the same influences and it’s an honour to have them on my record. I worked with guys that I really like!! I didn’t receive any invitation to participate on their record but I’m always ready for this. -Have you ever kept any clinic at music institutes? Do you have students? 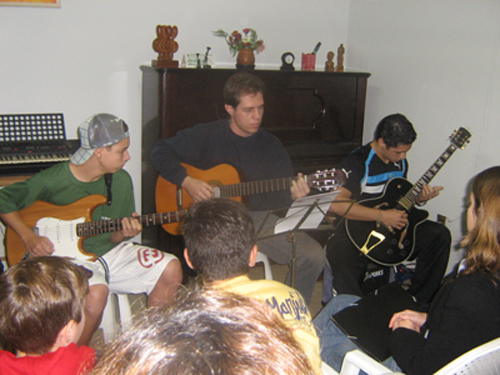 Yes, I used to make workshops and I teach in the major music institute from Porto Alegre city, called “Estação Musical”. I teach 30 students per week. Now, I believe you understand why I don’t have much time to organize my ideas but it’s great to be very busy with music. I teach different style as Rock, Blues, Metal and Pop. -In Europe almost all guitar heroes disappeared after grunge metal came out. Is the Brazilian scene still alive? What South American axemen do you recommend and esteem the most? Luckily guitar heroes haven't disappeared here but you have more places to play if you have a band with vocals as Malmsteen and Impellitteri. 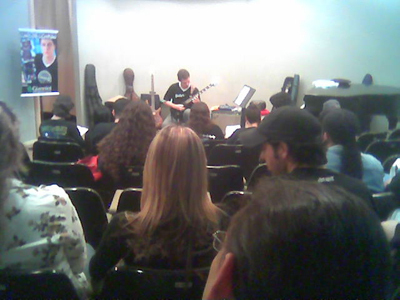 There are guys as Frank Solari, Marcos De Ros, Pablo Soler around that used to play alive with their instrumental works. I recommend two players: First one: Edu Ardanuy. 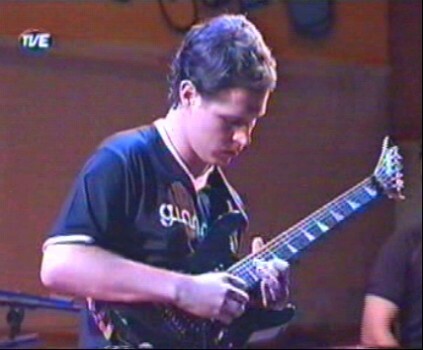 In my opinion, he is the best guitarist from Brazil. He has great technique, feeling and melodies. Second one: CJ from Brazilian Hard Rock Réus Anjos. This guy rocks!!! A great friend and player as well!! -What would you advice a young boy or girl who wishes to become a professional guitarist? Which are the mistakes to avoid and what is necessary besides practice? I can say: “Play what you like, believe in yourself, practice all time, learn music all time. If you like metal, study metal! If you like classic music, study classic music! Be different, because the world needs different players! Find your own way of playing! Discover your goals!! And never forget who you are. Keep your head up high!! -How many hours do you practise everyday? What do you do besides playing? I practice and study all the time. I don’t have any other job. I’m a full-time musician! I’m a professional guitarist, music teacher, composer and producer. -Is it necessary or better to have long thin fingers to play a guitar better? Do you use elastics when you sleep to keep your fingers stretched? Can you play other instruments? I don’t believe that you need to have long thin finger to be a better guitarist. The only secret is to practice more! I never used anything to keep my finger stretched and I don’t think people use to do this! (I swear I personally know a professional guitarist who does it/Note of Markus G.) Yes, I play acoustic guitar, bass and I took some piano lessons years ago but I don’t practice at the piano. -Is the lineup of your band stable now or can we say you decided it to call it Carlos Lichman because the other members will always be session members? As a Metallica’s song, it’s SAD BUT TRUE. When I decided to be a solo musician it was because I could find players minded oriented like me. Since I was a child I knew what I wanted to be, the other guys wanted to be doctors and lawyers. I don’t like to change the line-up as you can see on the CD, Sandro Moreira and Vinicius Rym played with me in the EP “Intense Guitar Playing” but during the Firestorm recording sections they were very busy with their bands and were just able to record a few songs. -What about your live activity? What was the best concert you ever played and would you be able to play a 15-minute solo live like Yngwie Malmsteen? I believe my best concert was with Megadeth Cover in 2005. We played Megadeth’s songs all night long and as a solo musician and that was in an event called RS Guitar Concert in 2007. People can watch the videos on youtube. Yes, I’m able to play long solo guitars during a gig. It just depends on my mood! -Are you able to play your compositions on stage exactly as on the CD or are there any changes? Do you play them faster or do you like to offer slightly different versions? I recorded many guitars playing at the same time on the CD. To play exactly as on the CD, I need at least four guitarists on the stage. We usually play one guitar, bass and drums live, so it’s necessary to have some changes. I’m able to play faster than the original versions because I have improved a lot my speed picking but I prefer to play the original versions live. -Do you prefer to listen to guitar heroes or do you feel it’s better to listen to Metal bands where solos are not frequent and not important so as to keep your songwriting original and devoid of influences? Depends on the guitar heroes and the bands. You can be influenced by many players and bands but when you write a song it’s important to be original. It’s important to be different. I prefer old shred school and few guys from the new one. I listen to players as Randy Rhoads, Macalpine, Friedman, Gilbert, Becker, Impellitteri, Fareri, Soler, Horne, Ardanuy, Loureiro, Michael Angelo and new guys as Alex Laiho and Gus G.
When I listen to a band I prefer the old ones as Black Sabbath, Ozzy, Dio, Rush, Purple, Van Hallen, Maiden, Racer X. -I know that many guitarists are jealous of their equipment and prefer to keep some secrets, but all of your fans are curious! So, how many guitars do you own, which is your favourite guitar, what amplification and effects do you usually use? I just have two seven string guitars: an Ibanez 1527 (with Seymor Duncan super distortion pickups) and an Aria Mac (with Dimarzio evolution on the bridge and original Ibanez seven string on the neck), I have boss pedals (Metal Zone, Digital Delay) and Tube Scream from Ibanez. But I need to confess I prefer the distortion from Crate blue voodoo amp and Laney GH100L. They are the best in my opinion. I used Laney in the rhythm guitars of “Firestorm”. 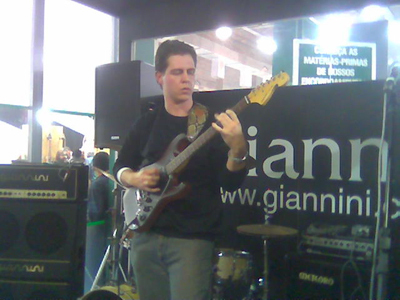 Like I said I’ve been endorsed by Giannini Strings since 2005. I used Giannini Strings 0.10 for seven string guitars live and in the studio; they’re the best strings I have been using in the last years! Very long life, great tuning, always a brillant sound and they are perfect for every kind of playing from Jazz to Metal! There are so many models that you can choose to be the best for you! And I’m endorsed by Basso Straps, the best strap ever, very confortable; I used it during my study sections, live performances and recording sections! I definitely recommend them! -Do you like fretless guitars, downtuned guitars or double-handled guitars or are you a traditionalist or you simply don’t need them? I prefer seven strings with 24 frets! I can play high sounds as well as low ones for metal tunings they are the best! But I would like to have a Jackson Randy Rhoads model. -Have you received any interesting offers from labels to re-release your discography and distribute it worldwide? Is there anything you would like to change in your old compositions? I received some interesting offers for a distribution from the label Die Hard records. Nowadays digital distribution is the best way to get known. Internet helps independent artists to get known. Well, as I said I’m able to play my songs faster and more aggressive than the original ones. But they represent a specific moment of my life and I keep them as I recorded them! -Do you have any videoclips online or in the works? Yes, people can watch some live performances as well instructional videos of mine on Youtube, but I don’t have any official clip to-date. -Carlos, thanks for your time. If you need to add more details, information or tell your fans about updates and new plans, feel free to take all the place on this magazine you need. Well, first I would like to thank RockMetalBands.com for the opportunity and support; and to all the guys that will read the interview, you can check the news on my web site www.carloslichman.com to know more about my future releases and if you are interested in my CD “Firestorm” you have six ways to order the CD from my web site. Choose the best one to you! -He also recorded a guest solo in the project "O Solo é SEu" from brazilian Guitar Player Magazine.